The Danube River is Germany's second longest river and flows thru 10 countries - starting at the Black Forest and ends at the Black Sea. River cruise itineraries include voyages through countries like Germany, Austria, Slovakia, Hungary, Croatia, Serbia, Romania, Moldova,Ukraine and Bulgaria. These "Floating Hotels" cruise by beautiful cities, villages, castles and vineyards. The Danube River features several touristic sections on the river. Since the Rhine-Main-Danube Canal completed in 1992, the river has been part of a trans-European waterway from Rotterdam on the North Sea to Sukina on the Black Sea, a distance of 3,500 km (2,200 mi). Continuing on the Danube River, after Passau, next up is the Wachau Valley of Austria, one of the most beautiful sections of the Danube River. This wonderfully scenic valley lies between the Benedictine Abbey of Melk and the lovely town of Krems. 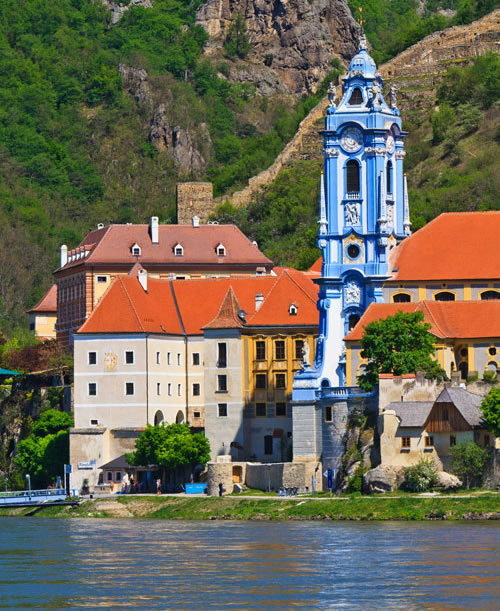 There are many charming towns, terraced vineyards, castles, and monasteries along the narrow Wachau Valley. Two popular stops are Bratislava and Durnstein. Due to its mild climate, the area of Wachau Valley grows the grapes and apricots used to produce white wines and apricot schnapps as well as apricot cakes and desserts, which are served in nearby restaurants. The paths along the Danube are great for biking and walking through the splendid scenery and exploring the old robber baron castles, and the legends and customs of the area. After the beautiful city of Budapest, the next area is the Iron Gates, which refers to a gorge on the River Danube. This wonderful landmark is nestled between Romania in the north and Serbia in the south and marks the location where the Danube divides the Carpathian and Balkan Mountains. The Iron Gates gorge, towards its Romanian side, constitutes the Iron Gates natural park, whereas towards its Serbian part, it constitutes the ?erdap national park. Originally, the Iron Gates comprised of four narrow gorges and three wide basins expanded over several miles of the river dividing Romania and Serbia. In order to control the speed of the river and make sailing though this part of the Danube River safer, a huge lock and dam was built in the 1960s. Presently, the river flowing through the Iron Gates is peaceful, and it is 130 feet higher than earlier to the dam and power station. Heading toward the end of the Danube River, you reach the Danube Delta, which has been a UNESCO World Heritage Site since 1991. Its wetlands support vast flocks of migratory birds. The Danube Delta is the largest river delta in the European Union, and is the most preserved on the continent. The greater part of the Danube Delta lies in Romania (Tulcea county), while its northern part, on the left bank of the Chilia arm, is situated in Ukraine (Odessa Oblast). Before or after a Danube River Cruise, many itineraries feature a pre or post land stay in Prague, located in the Czech Republic.? Prague is one of the most popular tourist destinations in the world. It was the ancient capital of Charles IV's Bohemian Kingdom, and has played a pivotal role in the development of Central Europe since the Middle Ages. No wonder, the prominent city boasts of several landmarks, monuments, cathedrals, museums and palaces, most of which have proud identity of existing on the list of UNESCO World Heritage Sites. Column 2 is the itinerary - click on itinerary and you will be taken to a chart listing a week by week detail of where the ship cruises. Though this cruise is one of the French cruises, this itinerary is primarily promoted to English Speaking travelers. Extensive List of Beverages included. What area(s) of Europe are you interested in traveling to? Insert Booking or Promo Code if you have one.